Sports-Fitness-Solutions Newsletter, Issue #034--Are You Drinking Your Calories? Simply making changes to what you DRINK can shrink your waistline, and help you to drop those unwanted pounds! This easy change could be the magic weight loss idea you've been looking for. Let's take a look at why. Nutrition studies are showing that what most people don't realize is that it's a lot easier to drink extra calories, than to eat them. So as a result, you really need to pay attention to what you're drinking. While a cup of hot coffee or a glass of lowfat milk are both great ways to start your day, beware of the smoothies. More often than not smoothies are closer to milkshakes than protein shakes. If you're not making your smoothie, try to check out what goes into your favorite. You might be surprised at the amount of calories and fat you find. A rstudy done at VPI not long ago, showed that people who drink 17oz. of water before sitting down for a meal ended up eating 9 percent fewer calories. 9 percent doesn't sound like much; but those calories can really add up over time. In addition, the water is great for you, as we've discussed many times before. Some of the worst drinks are soda or bottle ice teas. Both may have no fats; but they are loaded with sugar and calories. To be safe check the ingredients label before you choose a drink; and if you're not sure if it's OK, drink water. This afternoon pick me up delivers a huge amount of sugar into your system. To top the size of this sugar load, you would have to eat your way through three sticky orders of cotton candy. A big difference in sugar, fat, and calories. It makes no sense to follow up a great workout with a sugar filled beverage, even if it makes claims for quick recovery and muscle growth. After exercise your body is in need of protein, carbohydrates and potassium, so choose a beverage filled with these three components. There are known benefits to drinking alcohol in moderation (one or two drinks per day). Benefits such as raised HDL (good) cholesterol, boost in bloodflow, and improved sugar metabolism. A recent study in the journal BMC Public Health reported that people who have a daily drink were 54 percent less likely to be obese. However, it's called a beer belly for good reason, since many alcoholic beverages are loaded with calories. So whatever alcoholic beverage you choose, drink in moderation, or you'll find yourself battling the bulge. Finally recent studies are reporting that most of us drink 21 percent of our daily calories. That adds up to an average of 460 calories each day. Based on that statistic, it's easy to see how these calories quickly add up into unwanted pounds. So how do you beat this trend of drinking yourself fat? Simply pay extra attention to what you drink throughout each day. Make it a habit to pass on the high calorie drinks and to focus on drinking lots of water. As we've discussed numerous times before, proper hydration is critically important to you're overall heath and fitness. Staying hydrated enhances weight loss. Filling your stomach with water before meals prevents overeating. Quenching your thirst with water hydrates your skin, giving it a more youthful glow. So watch what you drink; and if I can be of help, feel free to contact me. Until next time, "Remember, Stay Fit You'll Feel Better." 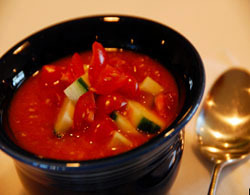 Gazpacho is a cold tomato based soup that originated in Spain. It's another hot Summer here in South Texas and what better time to enjoy a chilled bowl of gazpacho than on a hot summer day? Use fresh ingredients for a taste that I think you'll really enjoy. Give it a try and let me know what you think. Place all of the ingredients, except tomato and cucumber garnish, in a high speed blender. Turn on high speed for 40 seconds. Chill the soup for 30-60 minutes. Place chopped cucumber and tomato in each serving dish and fill with soup. Serve immediately. One serving equals: 85 calories, 2.5g fat, 15g carbohydrate, 2.5g fiber, and 3g protein.